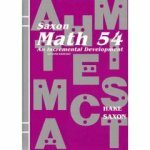 I have been using Saxon Math for two years now, and I love it. My children are mastering concepts that I never had to learn at their grade level. Each lesson is the same. My kids understand what is expected of them. They are eager to learn and get their questions completed. I do not follow the teacher book precisely. I find it takes a lot of time to do all the exercises. Once you understand the Saxon system, you can change it to meet your child’s needs. I make sure all my children does the practice exercises daily. We start with review or CD teacher, then we do the exercises. The Cd-rom teacher helps free up my time so I can work with my younger child. I recommend everyone try Saxon Math. The first few months with this system may feel like a lot of time is spent on Math daily. Once you understand the system and your child does too, you can usually get through it faster. Patience pays off. My second year with this system has been so easy! I’m loving it. I have no fear about my child acing the end of the year test.